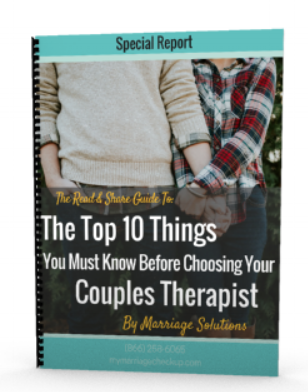 Results from Couples Therapy depends on a number of factors, your goals, and your commitment to the process. This depends on a number of factors, your goals, and your commitment to the process. Take turns talking - the counselor promises to give you a chance to talk but you’ll be most successful by not talking over each other. Read the materials - you will find your understanding of the process will be so much greater and you’ll get further in our time together. Trust the process - We have the formula for success and we are itching to share it with you! If you follow our lead you will find the success you are looking for. We have helped hundreds of couples save and strengthen their relationship and we want you to be one of our many success stories. At our two locations, we have chosen to limit our practice to just counseling couples which allows us to deliver premium care to every client every time. Our role as therapists is a lot like being a personal trainer at a gym. You can have the best personal trainer and not lose weight because the results are determined by the client and the work they put into it. Therapy works best when you are motivated to change. De-escalation. You will experience fewer fights, and it will be a more peaceful time in your marriage. The "Pursuer" will probably have softened their blaming and demanding somewhat. If we stop here you will experience relapse a few months after we are done with therapy. Restructuring Engagements. In this phase of treatment we want "withdrawer re-engagement" which means we want the distancer to begin to assert themselves in the relationship, and begin to ask for what they want and need from their partner. Consolidation. We will tackle problems that have been issues in the marriage. We only want to do this once you and your partner feel a strong emotional connection. Agreeing on everything doesn't mean you'll have an intimate relationship that is why we don't focus on this at the beginning. You'll notice after you feel connected you'll be able to repair after a disagreement and solve many of your problems on your own. View our Resources page or blog section for more helpful information.